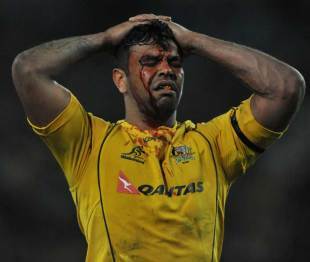 Wallabies and Melbourne Rebels star Kurtley Beale has agreed to take part in justice mediation around an incident that allegedly occurred at the Victory Hotel in Brisbane during the early hours of June 8, 2012 - the morning before Australia played Wales in a Test match. Beale is accused of assaulting a bouncer at the inner-city hotel after he was refused entry while out on the town with team-mate Quade Cooper. The case was tabled at a Brisbane Magistrates Court on Wednesday morning, where Beale's lawyer confirmed his client would meet his alleged victim in an effort to resolve the case. when he and Cooper were caught trying to re-enter the venue after being ejected earlier in the night. Beale did not appear in court, with his lawyer representing him to seek a further period of justice mediation to try and resolve the matter. Magistrate Bevan Manthey granted the request based on Beale agreeing to meet his victim, and he adjourned the case until April 17. The Australian Rugby Union postponed a disciplinary process concerning Beale until the legal matter was resolved, meaning he has available for all representative selection since the alleged offence. Under Queensland law, justice mediation is a voluntary process that is confidential and free. Offences that include stealing, assault, wilful damage and unlawful use of a motor vehicle can all be referred to mediation.